Choosing a shower enclosure should be easy, but with so many to choose from you may be hesitant on which one is the right option for your bathroom. Hinged shower doors offer style and elegance to any bathroom space, they can blend in with your bathroom design assisting you in finishing your bathroom to perfection. What you will notice when looking at hinged door shower enclosures is that you have two options available, there are framed and frameless designs and you choice can be determined depending on whether you are working with a modern or traditional bathroom. The framed designs are finished in chrome helping it blend in beautifully with your bath and basin taps, shower head, shower valves and your designer radiator, if you have one. These are perfect for both modern and traditional bathroom designs. The gentle curve of the door offers additional showering space, but be sure your enclosure is bowed, these hinged door shower enclosures only work with the Sloegrin shower trays, matching perfectly and ensuring that the shower is fully enclosed, reducing the risk of leaks. The frameless hinged door shower enclosures are the ideal choice for both ultra-modern and modern bathroom designs following through with the minimalist design. The chrome handle blends in with the rest of your fixtures and fittings while the plain glass of the enclosure allows light to flow through with ease, making the space feel lighter and brighter. Of course your shower enclosure will depend on the shower tray you intend on placing in the bathroom. For example, the frameless hinged door shower enclosures work beautifully in a recess space where you have chosen to place a shower with straight edges and a modern finish. You always need to take the space you have into consideration when choosing these shower doors because they do open up into the bathroom. The hinge allows the door to swing open with ease giving you a large opening to get in and out of the shower. If you think you may have obstacles in the way, be sure to measure and then measure again, as there is nothing worse than your shower door not opening completely and having to squeeze through the opening. When you choose the hinged door shower enclosures for your bathroom you can enjoy an elegant and stylish finish to your design, a centre piece of your bathroom that is cool and modern. What do you think of when you think of the word “modern?” Do you think of straight edges, minimalistic, white and bright? Modern is a popular choice for bathrooms these days, the streamlined designs, the elegant touches, the square bathroom products and the white, glass and chrome finishes. When choosing a shower for your modern bathroom you need to choose a shower tray that blends in with your bathroom design while remaining both functional and practical. This is why I love the square shower trays, they offer the straight edges and you can place them in the corner of the bathroom or against a wall, wherever you have chosen to place your shower. Where is Your Shower Going? Your first decision before you go out and buy a shower tray is to determine where you are placing it in your bathroom. Often I choose a corner position which helps maximise the floor space of the bathroom leaving you room to place a bath if you have the room and all your other essential bathroom products. Maybe you have a recess area in your bathroom, the perfect place for a shower. Again this is where the square shower trays come in, often fitting into the space with ease and then there is placing the shower along a wall. Combining the square shower trays with a stylish enclosure, panels and accessories and you have a sophisticated space to be proud of. What Door Are You Choosing? As you look at all the shower trays available you’ll notice that some of them only allow you the ability of a sliding door, now you may prefer the idea of a bi-fold door or a pivot door and with the square shower trays you are in control and just about any shower door will work with ease. For smaller bathrooms I would suggest that when installing your square shower trays you stick with the doors that do not swing open such as your sliding doors or bi-fold doors. The bi-fold doors are stylish and work on a concertina effect that allows you to make the most of the bathroom space you have available. For larger bathrooms you can choose any shower door to fit the square shower trays from the hinged and pivot doors that swing open to the walk in shower enclosures that don’t have a door and ooze sophistication and elegance to the sliding and bi-fold doors. With these trays you are in control of your own bathroom design. If you’re about to start renovating your bathroom and haven’t shopped around for shower door enclosures for a while, you’re in for a treat. There are so many different designs and styles to choose from including sliding doors, pivot door and bi fold door shower enclosures. Understanding how each one works and the advantages will help you make the right choice for your bathroom. The sliding door shower enclosures are often the most popular due to their clear glass design and being easily installed. These are mostly used in compact bathrooms where space is an issue, bear in mind when looking at the sliding door options that the door will only slide to a certain point, though this is often more than enough space to get in and out of the shower. Pivot doors are what they say, pivot and hinged doors swing open giving you an ample opening to get in and out of the shower with ease. While these doors are highly popular and convenient they aren’t practical for all bathrooms, bear in mind the door does need to swing open completely so you need to ensure there are no obstacles in the way. The bi fold door shower enclosures are a stylish option that uses a concertina effect to open the shower door. Basically the door folds inwards so it doesn’t compromise any of your bathroom space, it opens the full length of the door giving you ample space for getting in and out of the shower. When looking at the shower door enclosures available on the market it can be a little overwhelming, which is why I always suggest that you lay your bathroom out carefully, see what space you have available and then decide on the right shower door. You want your shower door to be stylish in design, the glass will blend in beautifully with any bathroom design, enhancing the space and making the bathroom feel more spacious. The bi fold door shower enclosures work well in both modern and traditional bathrooms, they are easy to use and clean making them a firm favourite. The ability to save space within your bathroom is essential, you want light, bright and spacious for any bathroom and the bi fold door shower enclosures give you the ability to do this. Well the new year has begun and it’s time to start tackling all those home improvements you have been putting off over the summer season. If one of your tasks is to include a shower in your bathroom you need to carefully select your shower enclosure, which is why you need to know what the pivot door shower enclosures are and whether they are the right choice for your bathroom. The truth of the matter is that it all comes down to the space you have available and personal preference. There are the sliding doors and bi-fold doors which are the perfect solution for smaller bathrooms where a pivot door would be an impractical choice. The pivot door shower enclosures are perfect if you don’t have anything obstructing the door, remember these doors swing open, so you need to leave enough space between your shower and other bathroom items. The pivot shower enclosures work really well when you install a shower in a recess of your bathroom, for example. You can’t have a hinged door because it won’t be able to open fully with a wall in the way, but the pivot of the pivot door shower enclosures allow the door to open completely without restricting how much space you have to get in and out of the shower. I remember years ago the property I lived in had the most compact bathroom I have ever seen and there was a shower in the far corner. Originally it had sliding doors which were great, but when the shower was replaced they popped hinged doors on there, which to put it plainly were completely impractical. We changed the hinged doors for a pivot door shower enclosure and never looked back. The door opened with ease giving us a large opening for getting in and out of the shower. We could choose between framed or frameless design, I went for the frameless because the bathroom was so small I wanted it as minimalistic as possible. Another advantage is that the pivot door shower enclosures are made with a glass door, the glass allows the light to shine through the door into the shower, this strangely enough gives the bathroom that spacious feel. In any bathroom there are two main things you need to make your bathroom feel larger, light colours, preferably white and plenty of bright light. 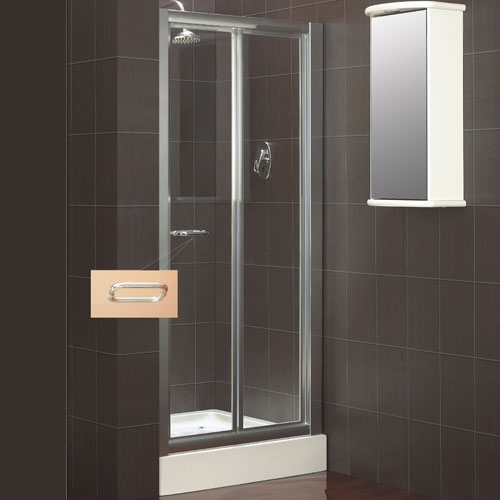 Hinged door shower enclosures are often chosen because they offer a swing open door that offers plenty of space when getting in and out of the shower. They are also one of the easiest to clean and offer a modern and minimalist design for the modern bathroom. If you intend installing your hinged door shower enclosure yourself then you will need some DIY knowledge. In fact on paper, these enclosures are really easy to install, but when it gets down to it you need to ensure that the work you have carried out is water tight and will not leak. Planning is a crucial step when installing hinged shower door enclosures. You need to measure the area you have available for your shower enclosure. Measure your tray from front to back and also from side to side, top to bottom. Remember to do these measurements a couple of times, rather be safe than sorry. Measure the opening space you have available for your hinged door. Bear in mind these doors swing open so you need to ensure there are no obstacles in the way. For this exercise I am presuming your shower tray is already in place, plumbed and ready to go, all you need to do now is attach your hinged door shower enclosure to complete the picture. On the side of your shower measure where you want your door to sit, place the jamb against the wall using a spirit level to ensure it is straight. Your next step will be to mark any drill holes on the wall with a pencil and then drill the holes ready to place the jamb. It’s always advisable to use anchors in each of the holes to ensure they are strong enough and hold the screws in place. Once your jamb is in place you can start installing your door. Hold your hinged door shower enclosure up against the opening to ensure it’s straight and that it can open with ease, also that the entire area is sealed once the door is closed. Drill the door into place double checking that the door opens out from the shower and not in. Your hinged door shower enclosure should now be in place. You can test it for leaks and get ready for your first shower in your new shower enclosure. I always find remodelling my bathroom such an exciting time, it’s when you get to change your bathroom from something traditional to something amazing and modern. 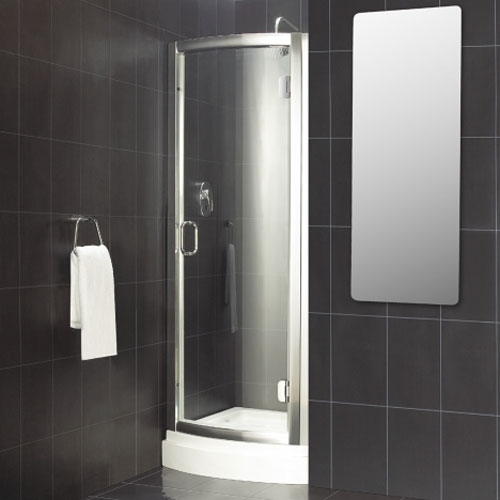 One of the hardest decisions you may need to face is what shower tray will work best in the space you have available. We don’t all have spacious bathrooms, in fact the majority of us will be working with a smaller bathroom. There are three things I always take into consideration that makes my decision so much easier. Before you start remodelling any bathroom you need to work out the space you have available, this will determine whether you should go for a corner shower or a square shower tray, the space you have will determine what is right for your overall bathroom design. You may not have realised this but your overall bathroom design plays an important role in the shower tray you choose. If you have chosen oval bathroom products including your toilet and basin, a rectangular tray will look out of place, the same applies when you choose modern and square, a square shower tray will definitely work better keeping the lines clean and crisp. By now you’ve noticed the selection of shower trays available. There are rectangular ones, quadrant ones and square shower trays all beckoning for you to choose them. Where to start? I find the square shower trays the most versatile of all shower trays. You can place them just about anywhere, they fit perfectly into an alcove, they work when you have two sides of wall and they work on their own with one wall and the rest shower enclosure panels. The other advantage with the square shower trays is the space they provide, they are large enough for you to enjoy a decent shower without being too cramped. I remember using a friends shower once when every time I bent down if I dropped the soap I would hit the edge of the shower enclosure and the door would open, I soaked her floor, that was due to the fact she had the tiniest shower enclosure I had ever seen. Even with a smaller bathroom there is no reason you shouldn’t get to enjoy your showering experience. Choose your shower tray with care, but if you want versatility, I highly recommend you see how a square shower tray will fit into the space you have available and how it can enhance your overall bathroom design. Now I know you’ve heard me waffle on about compact bathrooms in the modern home before and yes the homes are still being built smaller, leaving us with the difficult decisions that come with remodelling a small and compact bathroom. While the compact bathroom may seem like a frustrating experience for some, for many we grasp the challenge and find ways to make the area more spacious, using carefully chosen bathroom items, such as the sliding door shower enclosures, to enhance the space and make it work for us. I could probably complain about trying to manage working in a compact bathroom for hours, but today we are looking at ways to complement the space, make it feel bigger and how we do that is to embrace the challenge and find ways to increase our floor space without compromising on convenience. When working with a smaller bathroom area you need to plan your layout very carefully and I’ll tell you why. Placing your shower in the wrong place or putting your vanity unit opposite your shower can lead to you not being able to use the full space. Often you find with compact bathrooms that haven’t been planned correctly that cupboard doors won’t open. This brings me to my next point. 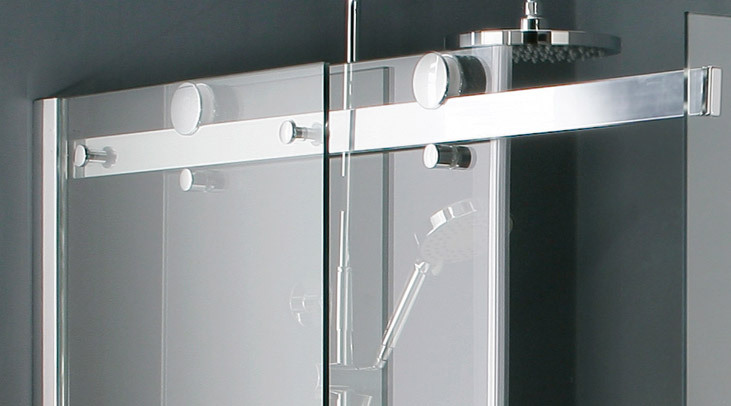 Sliding door shower enclosures are the ideal choice for the smaller bathroom. You can place your shower in your bathroom without worrying if your shower door with open. Unlike the pivot door option, sliding doors slide and don’t have to swing open. This is the most practical solution for any bathroom environment where you are trying to save on space wherever possible. Now that you have seen why the sliding door shower enclosures are the most practical solution for the compact bathroom you need to work on your colours. White or a very light colour is often the preferred choice for these small areas, a light colour immediately makes the area feel much bigger than it is. If you are desperate to add some colour to the room, buy some brightly coloured towels, a coloured blind or even some coloured candles to add the splash of colour you are looking for. Ensure you have plenty of light. If you don’t have the advantage of natural light, add lighting throughout the bathroom which can bounce through the sliding door shower enclosures, making the space feel light, bright and spacious.